Slippery Elm powder is always in my canine medicine box. 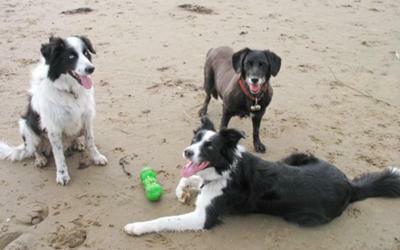 I've got 5 dogs so running to the vet for simple tummy upsets could become very expensive! Slippery Elm is an amazing remedy with many uses but for digestive/gastric upsets I just mix a teaspoon into a paste with boiling water and add it to a little food twice a day. If the situation hasn't resolved after 48 hours then it's time for expert advice, or if it worsens. It can also be used as a poultice. Great addition, Caroline, and a definite "must-have" to include in building a survival kit of natural pet remedies. I'm so glad you suggested it as I had forgotten that a holistic vet in Atlanta had provided slippery elm many years ago for stomach upsets and digestive problems. Good for humans and dogs! Good prices and selection here. Thank you! 2015 Update - Still Works! Update: Just reminded what a wonder this natural pet remedy is! We recently adopted a shelter pup who had some chronic digestive issues that we nor our vet could get a handle on fast enough. She would vomit her food, primarily in the middle the night. We suspect food allergies though possibly IBD so as we were taking measures to address the root cause, we desperately needed her to stop vomiting and stabilize her. Thank goodness, as we're updating the site, I was happily reminded about slippery elm. We prepare the slippery elm "tea" and began giving her a tablespoon prior to to each feeding. Eureka! The vomiting finally stopped (that evening!) and it seemed to sooth her stomach (BM issues improved too), allowing it to heal as we find the right food for her. What a huge relief -- such a relief! She actually loves the taste so she would just lap it up whenever "tea time" was announced. Always a pleasure to find something so innocuous and simple to help our furry, ailing babies! Slippery Elm works like heaven even now. I am glad to have encountered your website which helped me a lot.